A custom closet is only as good as your organization strategy. If your hanging bars and cubbies are a mess, your stuff is bound to get wrinkled and you won’t maximize your sophisticated design. Making the most of your space is why you invested in custom storage in the first place, isn’t it? Standard plastic hangers are most people’s go-to, and they’re great for basic t-shirts or casual attire. Make sure your plastic hangers have divots on either side to stop spaghetti straps or smooth fabrics from sliding down (nobody wants a pile of clothing at the bottom of their closet). Everyday hangers are sold in multiple colors, so you can also use them as a part of your organization strategy. Use a different color of hanger for each type of clothing (white hangers for tees, black for long-sleeved cotton shirts, etc.) if you’re looking to take your custom closet sorting to the next level – and you should be. Have you ever put your favorite sweater on, only to be annoyed that there is noticeable puckering on the shoulders? This is usually an indicator that you’re using the wrong hanger. Wooden hangers are more forgiving on luxury and delicate fabrics, and you should use them for your high-end blouses or expensive button-downs. Their smooth edges and thick, round ends won’t create indents in your tops. You can usually get wooden hangers in packs of five or so and they’re available in a variety of stains. Wood hangers pay off in spades by eliminating annoying dimples on your favorite silk long-sleeved dresses and designer capes. Stretched collars don’t scream “professional.” Luckily there is a way to preserve your expensive suit sets by switching from standard hangers to specialty suit hangers. This type of hanger usually consists of a wooden hanger with a felt-covered crossbar. You can hang the pants across the bar and use the contoured wooden hanger for the matching jacket. Not only do suit hangers keep your sets together and organized, but they provide a lot more support than regular hangers. You won’t have to worry about drooping shoulders on your structured blazers ever again. Getting your custom closet in order is a big job made easier with the right tools and accessories. 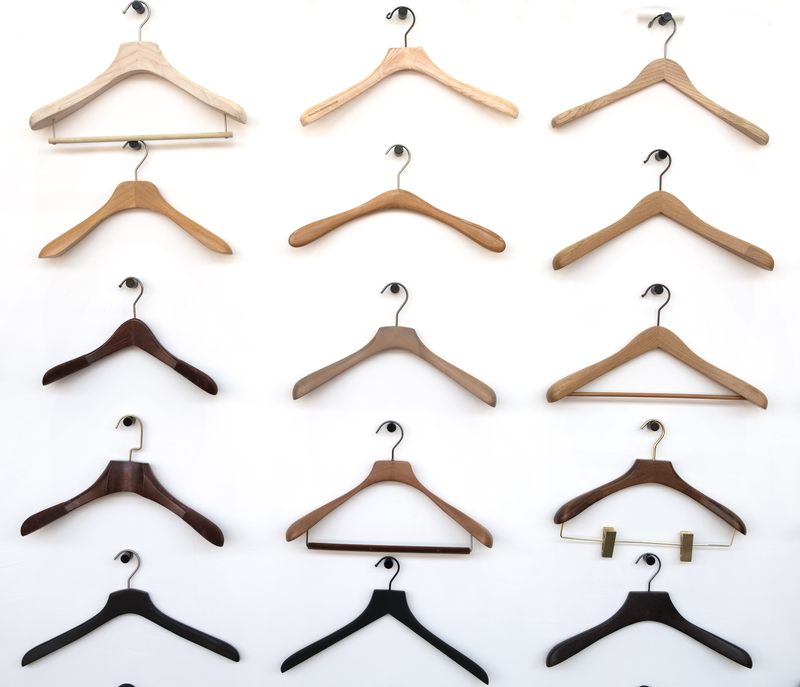 While some closet owners go for consistency with all wooden hangers, there is nothing wrong with blending an assortment of hangers each designed for their own usefulness. If you still aren’t sure how to create a closet space that works for you, contact Closet World today to learn more about our custom solutions for all types of homes.